Each of the 8 Lessons begins with an open-ended question or challenge involving a computer simulation to manage different and important aspects of personal finances. The higher the lesson number, the harder the challenge. Lessons 1-4 are introductory in nature and strongly RECOMMENDED as prerequisites for subsequent lessons. Each lesson is briefly described below. Lesson 1: Can Compound Interest Work For Me? An introduction to the system of compound interest, involving a 7-day challenge; Interest on short-term savings; scenarios for long-term college or retirement saving. Incorporating savings interest with saving and spending to achieve larger personal goals. Lesson 3: How Does A Credit Card Work? An introduction to how credit cards charge interest on unpaid balances; Strategies for paying off a single debt; then, regular card use. An Introduction a variety of common installment loans (car loans, personal loans, mortgages) with specified payback periods and regular monthly charges. Exploring how interest payments impact on long-term savings and spending. Adding realism with issues of changing value of the item purchased (appreciation or depreciation), together with changes in income. Lesson 7: Are You Ready to Be a Financial Counselor? Applying earlier lessons in managing income, spending, and interest (on savings and loans) to try and help others who find themselves in deep financial distress (due to poor management of savings, credit, and debt). Very Challenging! 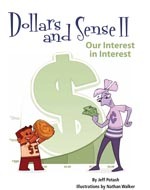 Lesson 8: Are You Ready to Manage Your Financial Interests? Developing a plan for juggling all of the financial instruments from earlier lessons in a quest to build one's "Personal Balance Sheet." Each lesson includes teacher/parent instructions and student worksheets - these are companions to the lesson simulations above. #1: Can Compound Interest Work for Me? #2: How Can I Maximize Savings While Spending? #3: How Does a Credit Card Work? #4: Borrowing on Time (Installment Loans) #5: Managing Credit with Savings and Spending #6: Compounding Questions for Installment Loans #7: Are You Ready to Be a Financial Counselor? #8: Are You Ready to Manage Your Future Interests?